As I sat there at the remote Cape Bise in northern Okinawa, with the sun setting, the warm sun on my shoulders, and a cold Orion beer in my hand, I felt I could stay there forever. And ever. And ever. “What time is your flight back tomorrow?” I teased my husband. The next day, we departed Motobu and drove the two hours back to Naha to get to the airport, for what was supposed to be an easy, quick, two-hour flight back to Hong Kong. We boarded the plane, and waited. One hour passed. We wondered what was going on, why the delay. Finally the captain informed the passengers that there was a technical problem, and they were trying to locate an engineer to come fix it. Joy of joys! My first reaction — YES!!! If this plane can’t get off the ground, we get another day in Okinawa! One more extra bonus day! Yaaaaaay! So, we waited. And waited. Another hour passed. The cabin crew served more drinks and snacks to try to keep the passengers calm. I wasn’t too worried — I was thinking about the all-you-can-drink all-you-can-eat restaurant in Naha that we could go to once we got off the plane. I was excited. We waited. A third hour passed. Excitement started to turn to boredom. What the hell was going on? What was taking so long? After the third hour, the captain finally admitted that nothing could be done, and we would in fact have to disembark, get our bags, and spend the night in Okinawa. Some passengers clapped! After all, it was a Friday, so it’s not like they were rushing to get back to work the following day. An extra night, in a hotel paid for by the airline? Score! What we didn’t count on was it taking another two hours before we could disembark. By then everyone was just tired, and fed up, and ready to go. Five hours! Sitting on a plane! For a two hour flight! We could have flown to Hong Kong and back in five hours. I was genuinely surprised that the passengers didn’t revolt. We had arrived at the airport at 2pm, and by the time we reached the hotel it was past 10pm. We were starving, and sweaty, and tired, and cranky. We dropped off our bags, and went out to find a place to eat some dinner, but found out that by local law, you can’t take a child into an izakaya after 10pm, so we had to walk around some more to try to find a place to take her. So, I’m sad to say our ‘bonus’ night in Naha was not quite as fun and we might have imagined, and was much more hassle than it was worth! Despite that travel hiccup, it was an otherwise beautiful, wonderful, relaxing trip. 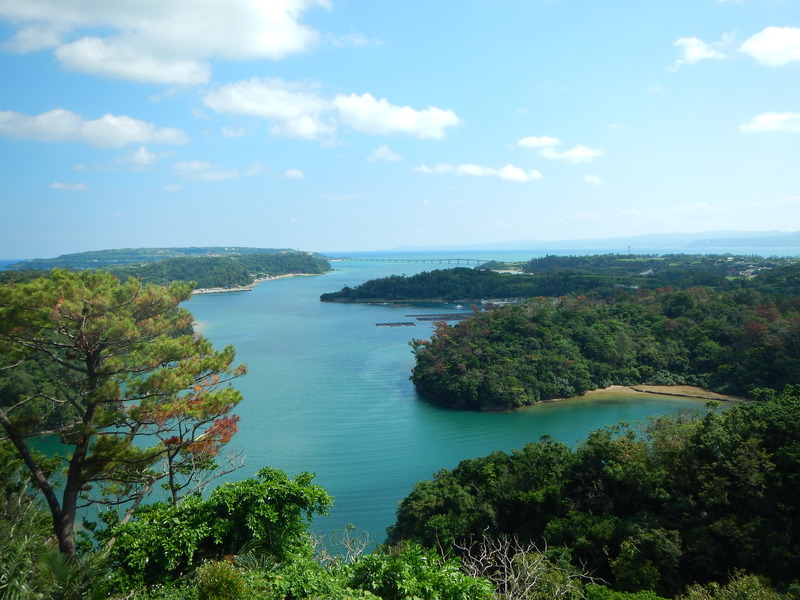 Motobu, in the northern part of the island, is a quiet peninsula full of beaches, coves, and smaller islands connected by bridge. The best place that we went to was Cape Bise, a remote little beach with very few people, no lifeguards, no loudspeakers playing music, and no jet skis. 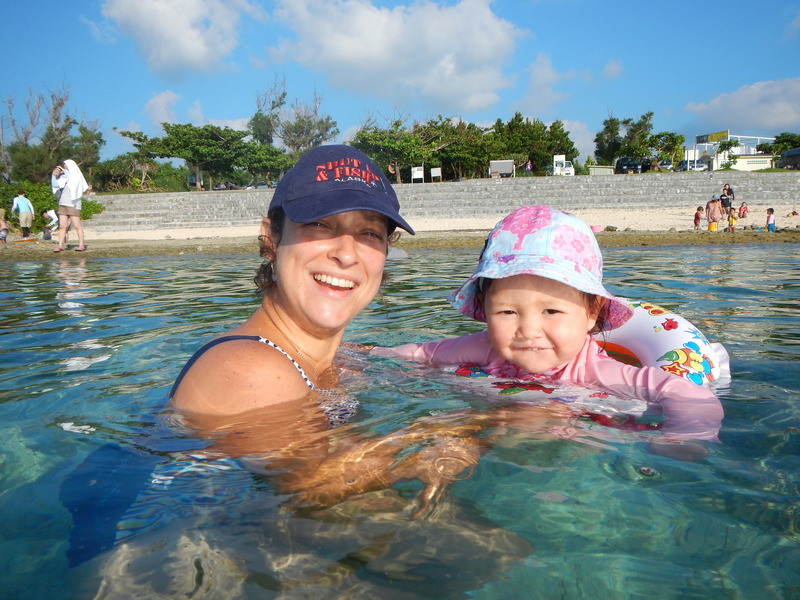 If you can manage to find the tiny sign that leads you to Cape Bise (or in Japanese, Bisezaki), you’ll find a little piece of paradise with incredible snorkelling. Parking is ¥500 and there are public bathrooms and even pay showers at a tiny dive shop, if you need to wash off after the dip. Just behind the beach is a beautiful path that goes through a tunnel of trees. It’s green and shady, and you can rent bicycles to ride through it. But it is hard to find indeed! Don’t make me go back to Hong Kong, mum! Motobu has loads of hotels, since the Churaumi Aquarium is in Motobu, but this time we took a chance and stayed at what is known in Japanese hotel terminology as a ‘pension’. Meaning that it’s cheap and a bit basic, but otherwise fine. 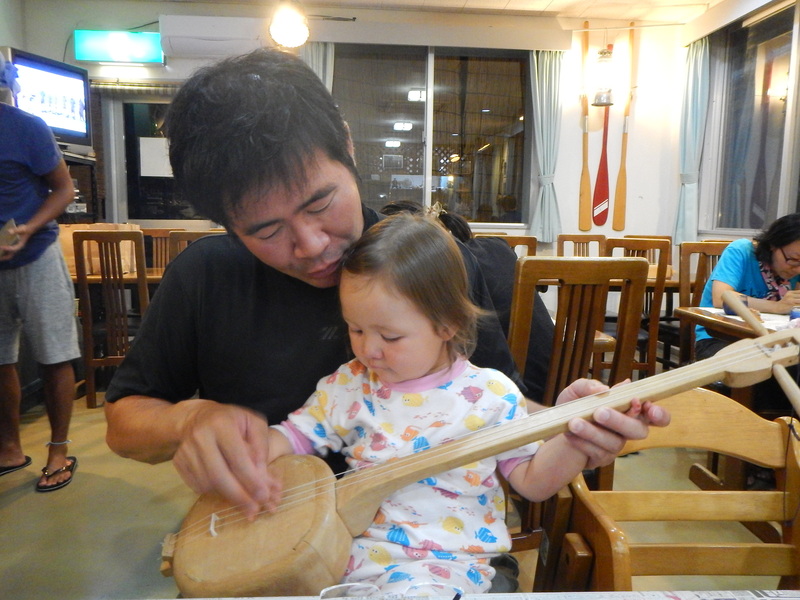 Not the nicest place we’ve stayed, not by a long shot, but the owners of this budget stay offered all kinds of fun activities, like shisa making and learning how to play Okinawa’s native instrument, the three-stringed sanshin. 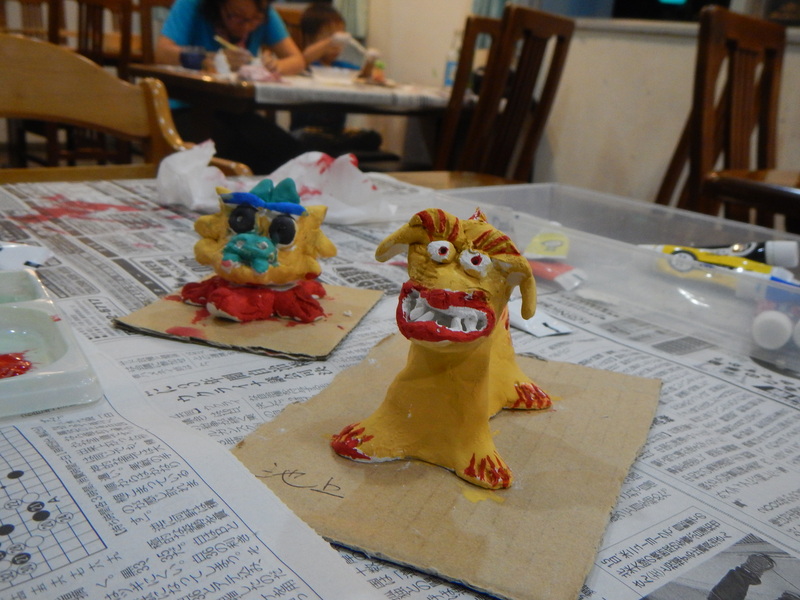 Our shisa (the one on the right, in yellow and red) came out looking like a canine drag queen, but we took it home anyway, and it is now sitting on our window ledge, staring at us when we wash dishes. 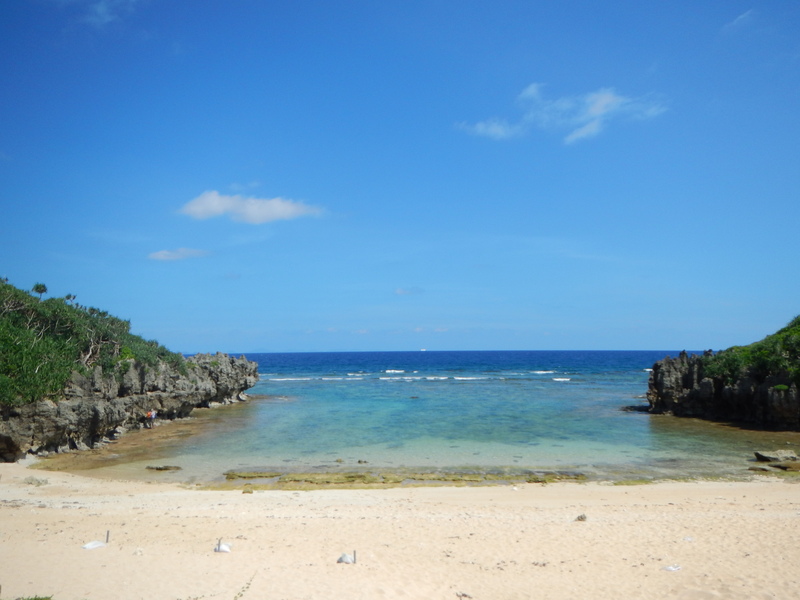 Anyway, with just a two-hour flight, I know Okinawa is a place we’ll go back to again and again. You went to Okinawa for your anniversary? Beautiful places! I want to visit there sometime. That 5 hour wait on the plane must have been so boring (but it makes for a good story). 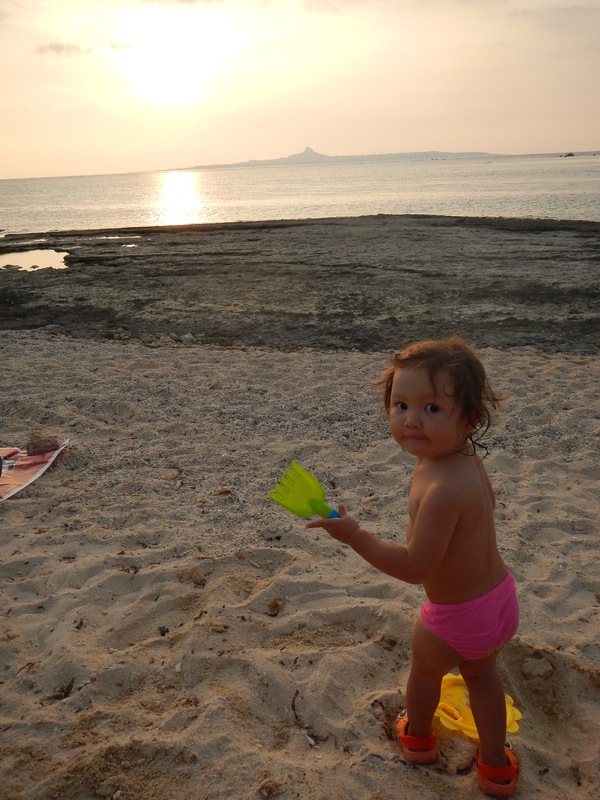 So glad you were able to enjoy Okinawa. It looks great and relaxing. Miss you guys.